Whoops! So yeah, sike on the Warcraft 3 map. I'll probably still continue working on it, but the big kids that sit at the big kid table during Thanksgiving use the Neverwinter Nights Toolset, and woo boy that toolset is off the troutscale. Where in Warcraft I'm happliy plunking down NPCs and creating nifty little If/Then statements in the trigger editor, NWN2 requires that you actually code the location of every shrub in binary. Like ones and zeros: 0001010 0110010010 10010 1001. It's much more advanced, and by more advanced I mean you just write code. That's cool, I'll figure it out. I kinda had a few cool ideas for my WC3 map, though, so will probably go back to that once in a while when I want to stab myself in the face. Playing with Legos is fun, and relaxing! In the end, it's a better experience, and a true test of whether or not I can learn a new piece of software (and scripting language) on demand. I was kinda fudging it with WC3, as I already knew my way around the editor, I was just digging deeper. With NWN, I'm Alladin on the magic carpet, converting Integers into Strings, and singing A WHOLE NEW WORRRLLLDDD!!! I keep going back to my basic principle of having multiple keys to unlock a final showdown, and I keep realizing that I'm horrible at single player RPGs. I kinda click around randomly, and in NWN that means I'm pulling up the inspect menu every time I want to attack something. Plus NWN is totally hax! You can just make your dude level whatever with whatever gear that has plus whatever stats. Oh, sure you honestly earned the Uber Duber Sword of the Tuber Luber. Riiight. You didn't just make a module that was like 'zone in, loot sword, award myself 10 zillion XP woohoo!'. How do I tune for that? Just throw random mobs around and assume the guy is gimping himself to make it a challenge? How does that even work? In WC3 I could assume players started as level 1, and the longer they played, the harder mobs got. Hmm... more to figure out, I guess. Oh, well. At the end of today, having spent about 6-7 hours poring over tutorials, I've got my basic plotline set up. It's a dungeon crawl, set up in an underground lair. The town above has been wiped out by an undead army set loose by a doctor whose son had died in an accident. He dabbled in a bit of the ol' dark magics to bring him back to life, and was exiled. He fled to a nearby cave and at night would come and dig up the dead from the graveyard, enlisting these dead as his workforce to burrow under the town directly. Over time he's perfected his craft, and connected his underground network of tunnels to come up through the outhouses above ground (mmm... stinky zombies....). while the fools on the surface make their day and night rounds. I labor in silence; in my mind is no doubt. the dead will rerise, as before did my son. when they cower before the new powers that be. the path is quite simple, just down every stair. but I'll leave special hints, so your path may be true. going right you'll be left, going left you'll be right. But then of those two, which will you desire? The cold stone of death, or the warmth of life's fire? Basically, make a map with decent immersion, a good story, some interesting puzzles, that don't have to many imba fights (maybe throw in some NPC helpers, or something to even things out for soloers). And if you're worried about uber items so much, level everyone to 20 immediately (or whatever max is), then give them uber items. Then make it about RP. Glad to see you are working on your ideas still. GL on the NWN editor. I'll playtest any NWN you come up with. I've got both. Iso, please don't joke about the wow cards. I emailed you the three codes something like two months ago. 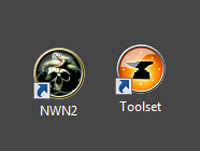 I just put NWN2 on my laptop three weeks ago so I can play it in hotels when I'm working out of town. Would love to play/playtest your module whenever you get it to testing/release phase. Good luck and keep truckin. Grats on the contact from an actual gaming business person too!